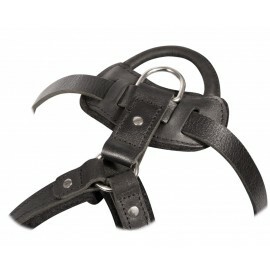 Leather Dog Harnesses There are 18 products. Extra durable leather dog harness with wide felt-lined chest plate for Labrador walking, training and work. 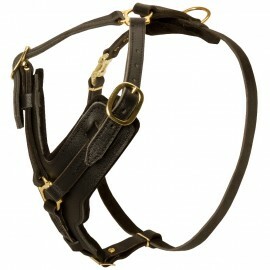 Freedom of movement, convenience, comfort and reliable control in one leather harness for your Labrador! Small leather harness with felt padded chest plate, adjustable straps and quick-release buckle for safe and convenient Labrador puppy walking and exercising. Non-restrictive, fully adjustable leather harness with felt lining on the chest plate and luxury brass hardware for Labrador walking and tracking. Maximum comfort and freedom for Labrador, super dog control for the handler. 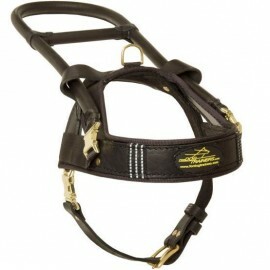 Super light-weighted and functional harness of natural leather for various Labrador activities. Felt lining on the chest strap provides comfort and safety for the dog. Solid gold-shining brass hardware give maximum security even at hard loads. Perfect harness for long walks and tracks. Light-weighted and extra strong leather harness of anatomical construction for long walks, training and tracking. Rust-resistant luxury looking brass details. Reliable stitching. Exceptional comfort for your Labrador. 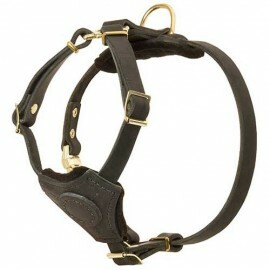 Heavy-duty leather dog harness with wide felt-lined breast plate to walk, train and work with your Labrador. 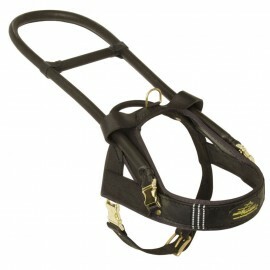 The harness is flexible and will not rub or wear into the skin of the dog. Equipped with rustproof nickel-plated fitments. Classic design. Top quality. Super comfort. 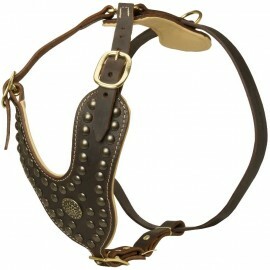 Spiked leather dog harness for Labrador walks and training sessions in style. Super strong, very comfortable, soft padded, adjustable, reliably stitched and riveted. Nickel-plated spikes on the chest plate will lay emphasis on Labrador beauty and strength. 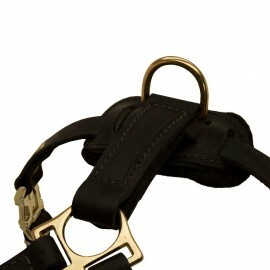 Ultrastrong leather dog harness with large felt-lined chest plate, wide and solid straps, luxury brass fittings. Robust and resilent. Comfortable and convenient. Fully adjustable. Handmade and hand stitched. Ideal variant for Labrador training, work, physical development and walks. 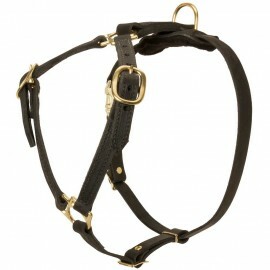 Exclusive harness of selected leather with soft Nappa padding on the chest and back plates for Labrador walks in style. 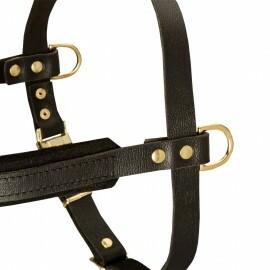 Bronze-like studs and brooch on the breast for luxurious look of your Lab. Exceptional comfort, quality and design. Hand work. 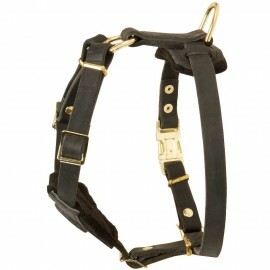 Glamorous leather harness with brass studs studded chest plate for Labrador fancy look. Comfortable and convenient. Luxury look and functionality. Soft and strong natural leather. Felt-lined chest and back plates. Goldish brass hardware. 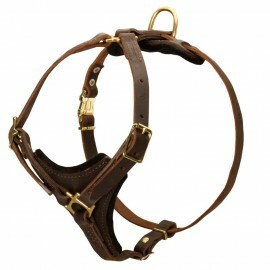 Robust and dressy Labrador harness. Decorated harness for Labrador style. The finest leather, wide felt-line and studded chest plate. Rustproof nickel-plated hardware. Comfort style. Top quality. Maximum freedom for the dog. Maximum control for you.